The first game of the four contests at the Spokane Arena is in the books and it was a good one. Twelfth-seeded Harvard pulled off a shocker and downed fifth-seeded Cincinnati by a score of 61-57. Because people love an underdog, the Spokane crowd was behind the Crimson for pretty much the whole game as they maintained a slim lead over the Bearcats throughout the entire contest. In the end, it was Harvard's defense that won the game, holding Cincy to just 37 percent shooting. The weird thing about this game was that it was an upset for sure, but Harvard looked like the better team for most of the contest. They didn't look small or unathletic. They straight outplayed Cincy. On the court now, the Michigan State Spartans are showing why so many folks have them winning the whole thing in their brackets, even if Delaware is hanging in there. The Spartans have a 44-33 lead on Delaware at halftime. The Harvard band looks like Harry Potter, sound like a dream. If you go to Harvard, you're probably a smart person. That's kind of their thing — being smart. 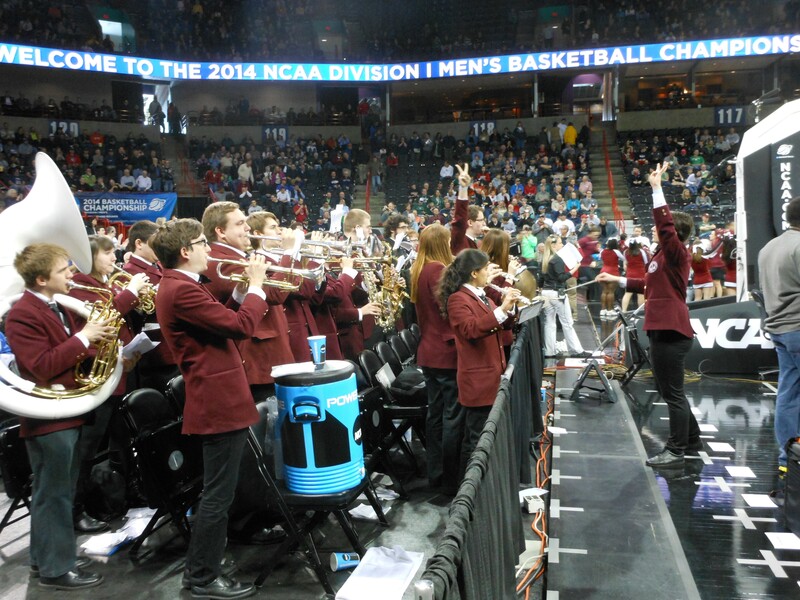 And some of those smart people make up the Harvard pep band, which was on hand for this morning's contest. They played some Top-40 hip hop in their set, with some added flair. They also looked downright awesome doing it. If you didn't know any better, you'd think they just came from pumping up the crowd at a Hogwart's quidditch match (yeah, I know my Harry Potter). Their blazers and ties are the sort of class you'd expect from Harvard, which also brought with them a sizable cheering section. Whether it was the band or not, the Spokane Arena sided with Harvard today. When time ran out and their win was final, you would have thought it was Gonzaga on the court by the way folks roared. Anthony Lee, left, and eight of his buddies drove all the way to Spokane from North Dakota. 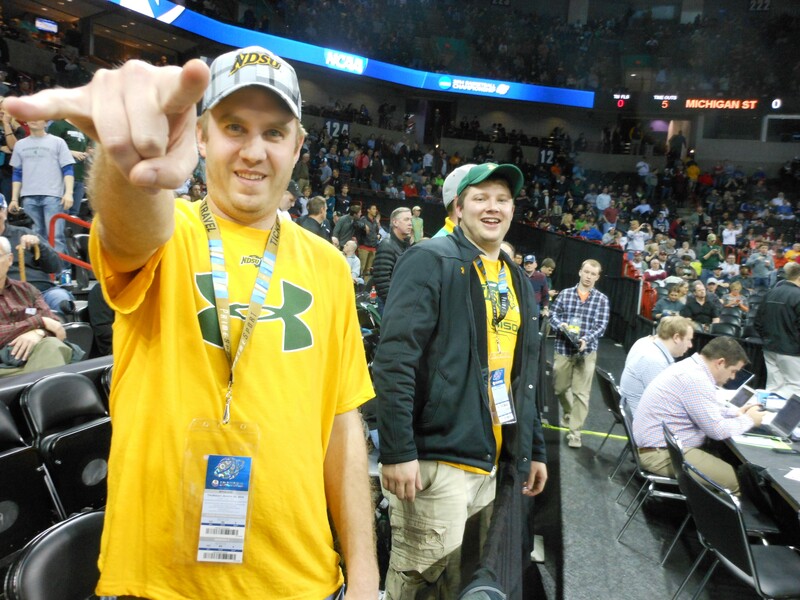 It's been awesome getting travel stories from all the fans who've descended on Spokane for the tournament. The best I've found so far is from nine guys from Westhope, North Dakota (a tiny town near the Canadian border) who drove all the way to Spokane in one push — all in one rented passenger van. Anthony Lee is one of the guys who charged some 16 hours straight to cheer on his North Dakota State Bison in a game against Oklahoma later today. "The second we heard that they were playing in Spokane, we decided we'd make the drive," says Lee. He and his buddies haven't had a chance to see much of the town. They rolled up to their hotel, checked in and then came to the Arena. Hopefully they'll get some sleep in there sometime. 28 better names for the University Gateway Bridge than "University Gateway Bridge"